“We understand that folks are curious about how their favorite park spots fared. We promise to share that ASAP,” the park service tweeted, warning that the blaze was still active after burning for nearly a week. A massive burn scar encompasses more than 30 square miles (80 square kilometers) within the recreation area that stretches from beaches to inland mountains straddling Los Angeles and Ventura counties. It’s the largest urban national park in the nation, with more than 30 million visitors every year. Cyril Jay-Rayon, 52, watched the news with despair as flames engulfed what he called his “main playground” — a rugged area where he rode his mountain bike a few times a week. It includes the famous Backbone Trail, a 65-mile (104-kilometer) route that offers challenging terrain for bikers and hikers who are rewarded with soaring views of the Pacific Ocean. 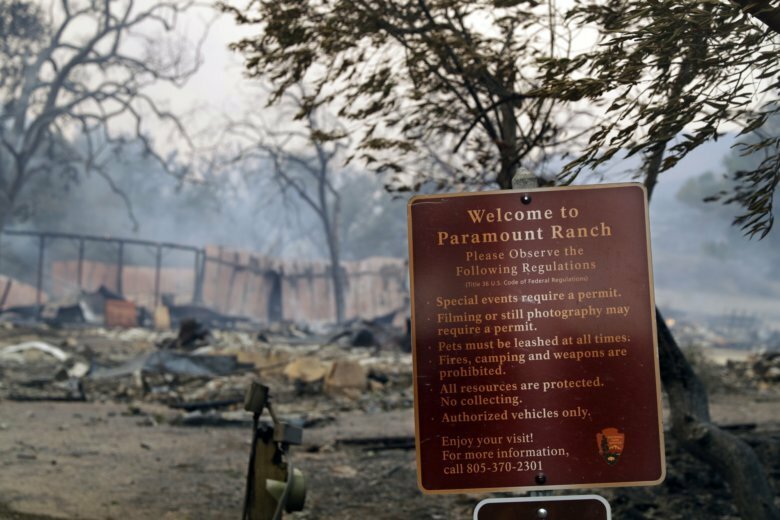 While the damage was still being assessed, officials confirmed that Paramount Ranch’s “Western Town,” a landmark film location dating to 1927 that included a jail, hotel and saloon, burned to the ground. The TV shows “Westworld,” ”The Mentalist” and “Dr. Quinn, Medicine Woman” were among the productions that shot there. There’s been an outpouring of public support for rebuilding the site, she said, adding that at least three homes of park employees were gutted.